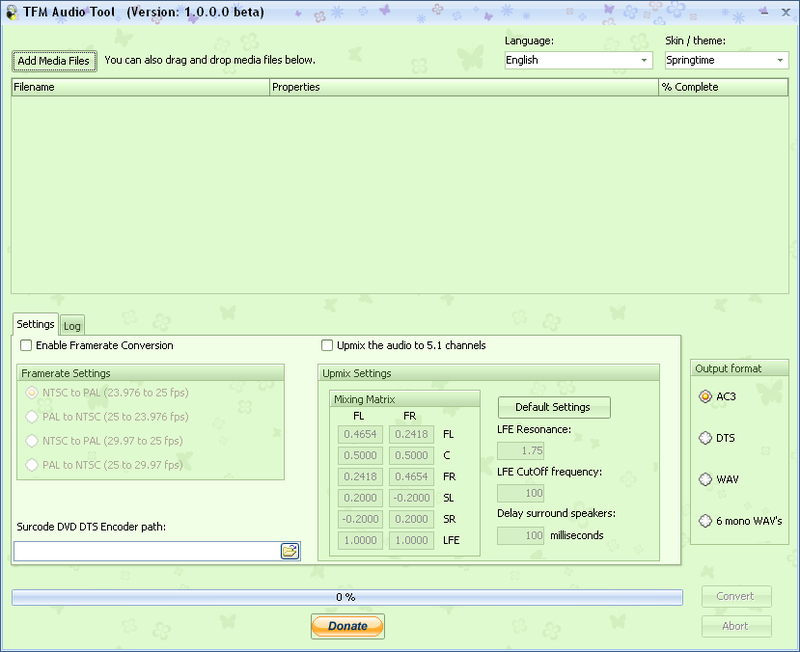 TFM Audio Tool is from the maker of The FilmMachine. Convert audio from movies (AVI, MKV, MOV, MP4 and RMVB) and separate audio streams (AC3, DTS, WAV and MP3) to AC3, DTS (Surcode DVD DTS Encoder required), WAV or 6 Mono WAV's. Can upmix audio to 5.1 audio. Can do framerate conversions between PAL and NTSC. You can set your own upmix matrix. Different skins available to give it an attractive look. At the moment translations in English and Dutch implemented. Implemented DTS encoding through DCAEnc (Thanks to LoRd_MuldeR). Implemented MP3 encoding through LAME MP3 encoder. Updated all bass libraries to their latest versions. Updated MediaInfo.dll to version 0.7.61. Fixed some other small bugs.